Andrea Dovizioso has beaten Jack Miller to top spot in Friday practice for the Argentina MotoGP by 0.009s. Free Practice 1 pace-setter Marc Marquez held top spot for much of the second session, and sat on a 1:39.497s before most of the field took new rear tyres for the final flyers. Cal Crutchlow, on his Castrol LCR Honda, was the first to usurp the Repsol Honda rider as FP2 moved into its final five minutes with a 1:39.346s. 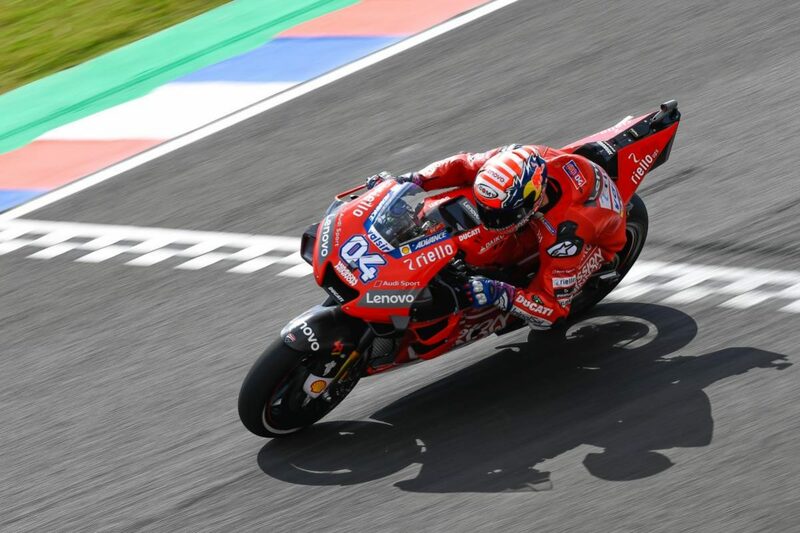 Miller, who crashed at Turn 13 early in the session, then wheeled his Pramac Ducati to a 1:39.190s before factory counterpart Dovizioso logged a 1:39.181s on the #04 Mission Winnow Ducati. Maverick Viñales (Monster Energy Yamaha), Crutchlow, and rookie Fabio Quartararo (Petronas SRT Yamaha) rounded out the top five. Valentino Rossi (Monster Energy Yamaha) was sixth while Marquez fell to eighth having not gone for a fresh tyre at the end. Jorge Lorenzo (Repsol Honda) was almost a second off the pace in 21st. FP3 starts on Sunday at 0050 AEDT, ahead of FP4 at 0425 and qualifying from 0505. Pos Num Rider Nat Team Bike Time Sess.